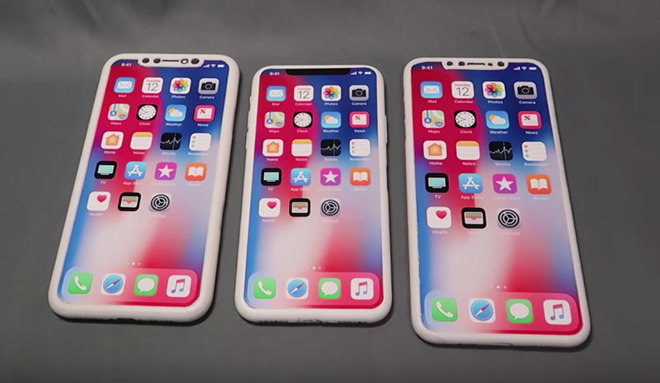 Hot on the heels of a supposed schematic leak detailing Apple's next-generation iPhone lineup, a report on Monday compares 3D printed mockups of the purported 2018 handsets with existing iPhone X hardware. Capitalizing on the alleged leak, vendors are marketing "prototype" dummy iPhones, including a larger 6.5-inch "iPhone X Plus" and a 6.1-inch LCD iPhone with TrueDepth sensor, on Chinese e-commerce marketplace Alibaba ahead of an expected product unveiling this fall. Japanese language blog Mac Otakara purchased a complete set and compared the mockups against a current-generation iPhone X, revealing a few subtle changes that may or may not make their way to production this fall. Whether the 3D printed parts were created based on reliable CAD data is unknown. As such, the following is presented solely for purposes of discussion. Expectedly, the publication found the 5.8-inch iPhone X refresh to be nearly identical to the current top-tier iPhone model. Button location and size are the same, while the positioning of cutouts for the downward-firing speaker and Lightning port mirrors existing hardware. The rear-facing dual-camera system appears to be slightly askew on the "prototype" version, though iPhone X cases with larger camera cutouts should have no problem accommodating the change, the report said. That said, the mockup's camera bump might simply be misaligned due to poor craftsmanship. Moving on to the 6.5-inch "iPhone X Plus" mockup, Mac Otakara found the unit was a mere 1mm taller, 1mm wider and 0.35mm thicker than Apple's iPhone 8 Plus. This lines up with previous rumors claiming Apple intends to market a high-end OLED handset that shares dimensions with its largest iPhone model. Instead of "forehead" and "chin" areas, the up-sized OLED phone is anticipated to incorporate a TrueDepth "notch" and edge-to-edge screen. Interestingly, the 3D printed version outlined in today's report sports seven speaker holes on its right side and four on its left. Whether the asymmetric design is part of the CAD or the result of spotty workmanship is unknown. Apple previously reserved the space to the left of iPhone's Lightning port for a 3.5mm headphone jack, though the company moved away from the standard audio connector with the launch of iPhone 7 in 2016. The 6.5-inch mockup's TrueDepth module appears to be the same size as that of iPhone X, though the array is slightly larger in the 6.1-inch LCD dummy. Other differences include a repositioned SIM card tray and slightly enlarger rear-facing camera bump with vertically aligned flash and microphone. Finally, the blog notes Apple is an unlikely to include rumored USB-C connectivity in 2018, at least according to the supplied dummies. Apple is widely expected to debut three new iPhone models later this year. A low-cost 6.1-inch LCD iPhone is rumored to anchor the line, while a refreshed iPhone X and jumbo-sized 6.5-inch OLED "iPhone X Plus" act as flagships.